This week we had the early summer edition of the Web Community event and, as ever, we had an enthusiastic and engaged bunch of attendees. It was an action-packed agenda (no change there then) and we managed to run out of time – again! So there will be a Web Community late summer event coming your way soon. Look out for the Doodle poll. As we look to planning events for the next academic year, we will reflect again on these and finesse them as needs be. As is tradition, we started off with the Web Team update. 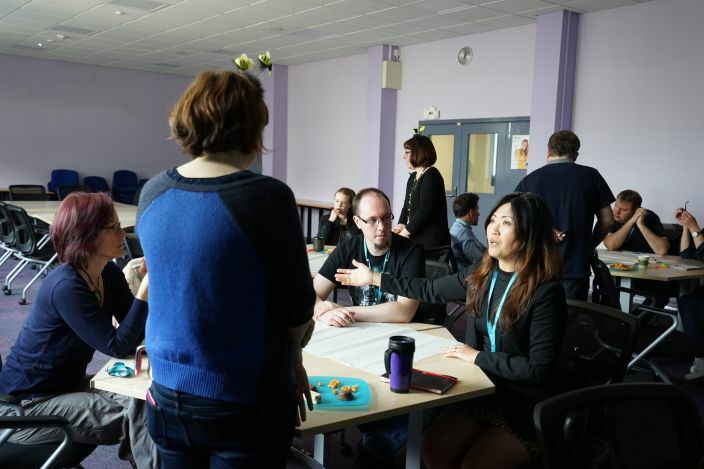 We’ve lots of projects on the go at the minute which will come to fruition around September (not least the Counselling Service, Career and Employability Services and the Disability Service) but we showcased some new projects and gave updates on some initiatives we had mentioned at previous events. We’ll circulate a full list of what is available so that you can embed them where you see fit, or send suggestions to us for future 360s. Paddy has been doing more work on the course search functionality adding in more options on which to search and also adding ‘auto suggest’ to the search box, which brings up suggested search results as the user is typing. Anna will now be working on styling the new search, and it will be added to our course pages over the next couple of weeks. Katie is working on new web content specifically aimed at parents to help them help their son or daughter navigate their way through the university student journey, and also inform them of some of the rules and regulations around having a son or daughters at university, e.g. university staff not being able to disclose any information about their child attending lectures or not. If you have been through a similar experience, and have some useful top tips to pass on, then do get in touch! Its that time of year when we start to look to the new academic year and begin to get everything ready for the new students joining us in September. As ever, there will be the New Students website (in development), and this will include everything that a new student needs to know about enrolling and starting their University life. The Timetabling and Attendance website has recently been redeveloped, and now makes much more sense, and this year all academic timetables, and Induction timetables, will live within this site, ordered by subject area within Faculties. We are working with the Timetabling team, and also Neil from Engineering and Informatics, on a more automated solution to getting the hundreds of timetables from Syllabus + and onto the website. Neil has done some great development work already so it looks like we’re on to a winner! Thanks Neil. As soon as we have more information we will feed back to the Enrolment Planning Group and colleagues across the University. We have been working the Student Finance team, and also Stephen in IT, on the development and deployment of a new scholarships database, which will replace the very manual job of updating the scholarships and funding web pages each year. Users will be able to simply search the database, e.g. by which country they are from, or which year of entry they are interested in, and they will get the funding opportunities available to them. Other web pages, e.g. the country-specific pages, will be able to pull in information from the database, rather than this being added manually. The next stage is to populate the database and then do some testing, with a predicted go-live of September. Katie gave a really good example of how different content gets different levels of activity across the year. The Global Development Scholarship was open to applications last month and was getting more traffic than the external home page! Katie created an analytics report for the Student Finance team so that they could clearly see how much activity this page is getting and use that as part of their reporting. IP check – its coming off! When you log on to www.bradford.ac.uk the server magically does a check to see where you are. If you are on campus, and using a networked device, you are automatically served the internal home page. If you are off campus, or using a mobile device, you will be served the external home page. This is beginning (continuing!) to cause no end of confusion, and so we are going to remove the IP check. Hurrah! We have a bit of work to do behind the scenes to make sure that everything goes smoothly but look out for further communications on this in the next few weeks. Katie introduced the new (ish) Share This icons that are now popping up on our web pages, which enable visitors to our website to share content with others, or themselves, e.g. through social media or email. They are also location specific, so the China site has icons relevant to them, rather than Facebook and YouTube. Here’s an example course page so that you can see them for yourself! There is now a content type in T4 for you to be able to add the widget to your pages, but get in touch with us first should you wish to do so. We then moved on to a group exercise, the one that we ran out of time for last time! The aim of this session was to try and understand what others may think of your area, true or not, in order to be able to create stories to get messages across to different audiences and also turn any misconceptions around. Everyone worked in groups on just one area/website and initially chatted about what they, and others, thought that area did or was about. 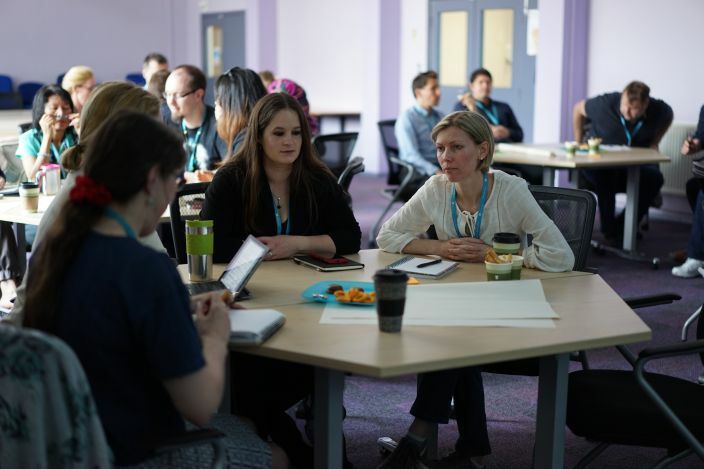 It was really interesting to hear, just in the room, the misconceptions that colleagues had of each others areas, so in just a very short space of time it was easy to do some user research and start to understand what others thought. The next part was to think about what stories would help get across what the area was really about and how best then to publish that content. Case studies, FAQs, videos, newsletters and so on, were all good examples of different ways of getting stories across. One piece of advice I gave was to not underestimate the power of talking to people face to face. Getting a few people together to chat about what you do and how you can benefit others is a great way of getting your message across and encouraging others to find out more about you by asking questions. It may be time consuming, but its worth it! Everyone seemed to enjoy the activity and get a lot out of it, so if you would like us to come and facilitate that type of activity in your area we are more than happy to do so. Lots of interesting discussions were had. 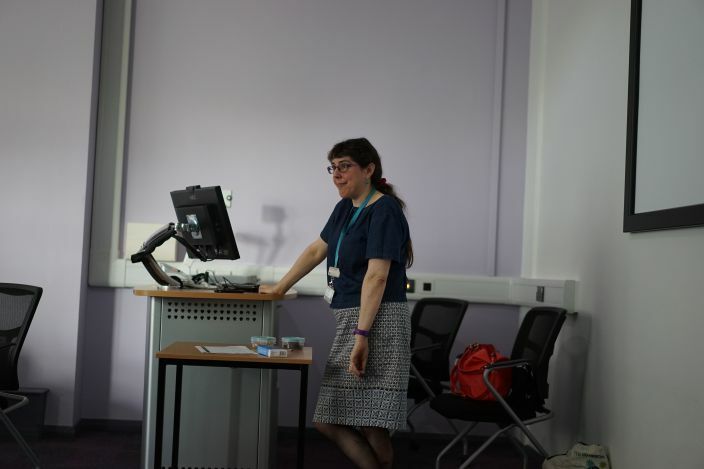 We were thrilled to have Alison Cullingford from Special Collections with us to talk about her work in Special Collections and also highlight the very important area of digital archiving. Special Collections is a wonderful resource of over 100 different collections, not least the archive of JB Priestley. Alison chatted us through the work of the team (Alison and one other person!) and how the demand for images can outweigh the resource that they have and fulfilling requests can often take a long time. But, this is all about to change with the introduction of ‘Vital’ – the new digital library that they are about to launch. Vital will enable all of the Special Collections’ amazing photos to be digitised and (where appropriate) made available to the public for use. Alison Cullingford from Special Collections. Alison also highlighted the important topic of Digital Archiving and how we ‘archive the web’ – or not. It is a hot topic and one that needs attention, so I am looking to get some input both from the sector and colleagues across the University to at least start the conversations around this area. We had two Show and Tellers this time. 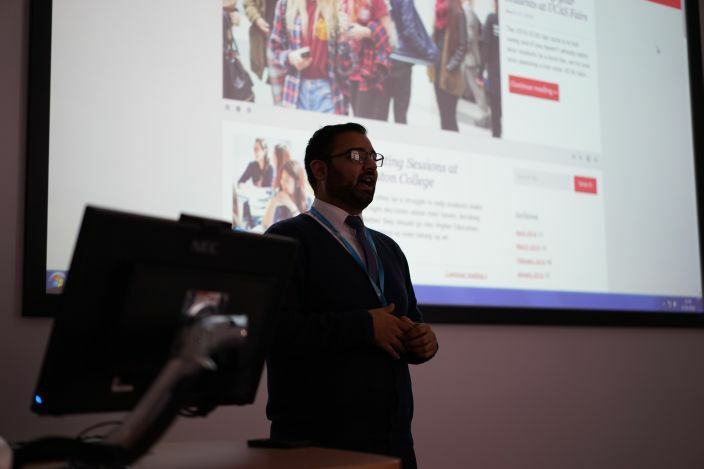 Maqbool Ahmad from the Student Recruitment and Outreach Team showcased their new blog which is aimed at the schools and colleges that the team are building relationships with. It gives details about the team and their ‘patches’ and activity, but is also a resource of advice and information for colleagues in schools and colleges to be able to help our their students on the road to HE. The blog is a great example of Content Marketing, where content is created to be useful and engaging, and not just a sell. Great work Team! Maqbool wowed us with his new Team blog! 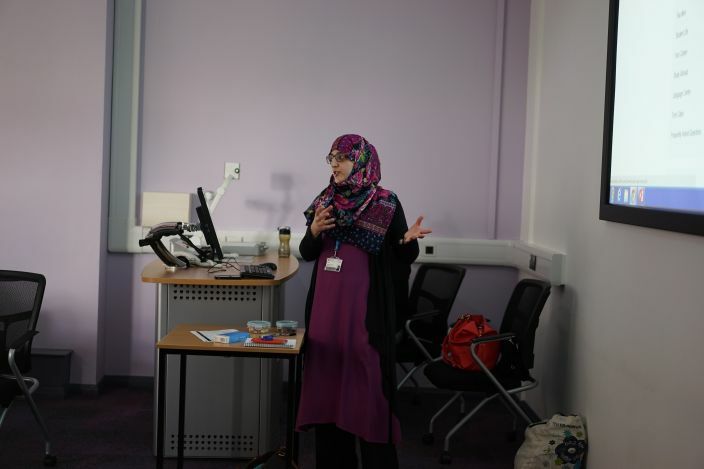 Ambreen Mirza from the Faculty of Life Sciences showcased the great work she has been doing on her course information, e.g. Archaeology – some of of which was highlighted in a global webinar that TerminalFour did on The Course Content Dilemma. You can watch the webinar here (YouTube link) – University starring role at 24 minutes! Ambreen has been working hard on the ‘value added’ content that can aid students in their decision-making process and really bring to life what it will be like to study here. Well done Ambreen! Star of the recent TerminalFour webinar, Ambreen! We started to run out of time, as usual, so we gave a brief introduction to the work that we have been doing to tidy up and standardise our use of the Google URL Builder. This will give us much better analytics and stats on the URLs that we use across different campaigns and different channels, whereas currently there are too many inconsistencies for us to get anything meaningful from the analytics. This is a really important area and so we will look at this more at the next event. In the meanwhile, if you are undertaking some activity for which you would like to measure the effectiveness of including a URL, get in touch and we can work with you on it. We all love SiteImprove, and we are super chuffed with some of the new features that have been deployed, namely the Analytics and the Heatmaps. We’ve only had them a couple of weeks but we are already beginning to better understand how our users look at our website and which areas they are most interested in. Stomachs were starting to rumble to after a brief intro we will look at this in more detail next time. We will squeeze another event in before the new academic year, sometime in July. We’ve always got plenty to cover and everyone seems to enjoy the events (let me know if this isn’t the case!). And then we will look to the new academic year and the next round of dates. All ideas and suggestions for what to include are gratefully accepted – don’t be shy! The events are for you and we want them to work, so keep us posted. Apologies for the shameless use of bees throughout the session – we were part of Team Bee Awesome in the end of year Tournament. Hope the deeley boppers weren’t too distracting! Till next time – here is the Sway from this time.